The Sega AGES line was first announced for the Switch eShop in April this year. The series will start out with 15 games and is being handled by emulation experts M2, who has a fantastic history working with Sega's retro releases. The latest game reveal is Space Harrier. As explained by Gematsu, the news was delivered during a "collaboration commercial" with the anime, High Score Girl. A release date for the title has not yet been announced. Space Harrier was originally released as an arcade game in 1985 and was more recently made available on the 3DS in 2013. Previous games revealed for the Sega AGES line include standalone versions of Sonic the Hedgehog, Thunder Force IV, Phantasy Star, Alex Kidd in Miracle World and Gain Ground. Sega has confirmed these games will eventually be released in the west. 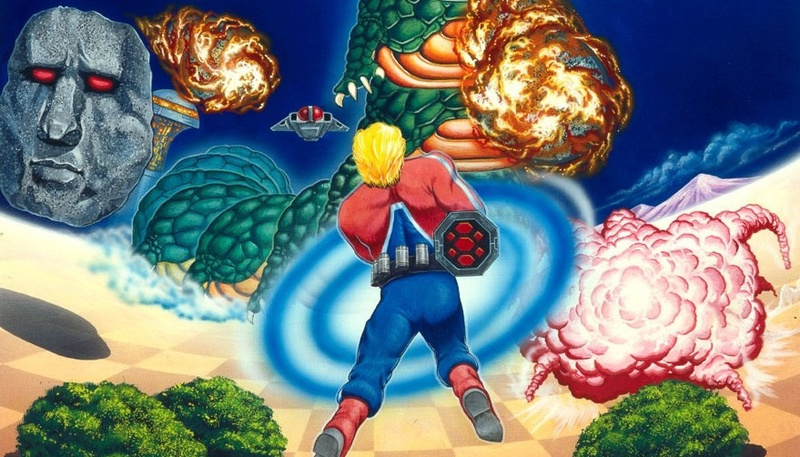 Are you glad to hear Space Harrier is coming to the Switch eShop? Are excited about any of the other above-mentioned games in the Sega AGES line? Would you like to see a specific game? Tell us in the comments. Man, I was just looking up Space Harrier ten hours ago, to find out whether or not the arcade version was available on any of the modern consoles. This is the arcade version, right? There are many other classic Sega arcade titles I'd be more pumped to see. Not the home versions, the real arcade deals. Golden Axe. Shinobi. Altered Beast. Alien Storm. The only one that got the 3D treatment for the 3DS was Altered Beast, and it was the abysmal home version. Not excited about any of these titles yet, as I already have the 3DS collections that cover some of these. I love a bit of Space Harrier. Bought it on 3DS will buy it again on Switch! HD Space Harrier with online leaderboards elevates this from being a casual 10 minutes here or there kind of game to a game I'll pump hours into. Day one! Love is not a big enough word for this game! I prefer the Sega Genesis classic collection that the PS4 got. The idea of retro classics is great, in reality there are so many new games coming out that they just become a collection that I rarely touch! I was blown away by Space Harrier visually, back in the day. But the actual game; not so much. @Sithee omg Outrun!! My favorite racer of all time!! That’s a must!! These games are rather the usual suspects, I'd like to see the arcade versions of Alien Storm, Revenge of Death Adder, Turbo Outrun. I still don't know why the latter stayed on 3DS in Japan only. Let's just see some games, how long does it take to get these ported and out. PSA - this game is a free bonus in Yakuza 0, Yakuza 6 and Shenmue HD. I'd much rather get a Switch port of Yakuza 0. Space Harrier is an okay game. I'd probably wait for a sale on it though. Streets of Rage trilogy, Golden Axe trilogy, and Super Hangon are my day 1 any price buys though. Still looks cool visually and aesthetically. If they could add in way more frames so the scaling was basically super smooth then I think this game would even be kinda striking today. These games need to stop being announced and just finally get to eShop! @sleepinglion Arcade ports of Golden Axe and Altered Beast were released digitally for PS3. I'd assume they were also released on 360. I keep hoping that one day we'll finally get Revenge of Death Adder. Already played it on 3DS and in Yakuza 0. I'll pass. What on Earth is Sega AGES and why is it so awful?! PS4 and Xbox One just got a Sega Collection on disc with 40+ retro games. Switch owners didn't, specifically because of this AGES nonsense. Why can't we just have a normal collection like everybody else? Oh, YEAH!! Now we're talkin! None of the announced games have me excited. I’ve played these a bunch of times already. I’d be far more excited for Saturn or Dreamcast than Genesis-era games because I’ve never played any of the library. There’s a bunch of classics I could finally experience. Slightly off topic but I’d love to play the Genesis version of Aladdin (even though the SNES version is far better) again someday. I doubt that’ll ever be available for download anytime soon. @construx I don’t think this is a subscription but a line of downloads like the NeoGeo or Nintendo arcade games. I agree with you though, I’d have much preferred the collection other systems got. I remember Space Harrier being so difficult on the Sega Master System when I was a kid. Looking forward to giving this a try. I can have a bad temper when I feel that a publisher wants to take more money from Switch owners than other console owners just because the Switch is a table+handheld combo and they know we like this control freedom so much, we will likely pay more. Basically the only way Sega could convince me not to hate them for this, if they release the same games for approx. the same price on Switch. Or if they throw us some Sega CD / Saturn / Dreamcast goodies in their retro section. @construx I'd take these individual releases of classic SEGA Arcade/Master System/Megadrive games that have each been masterfully ported by M2 and sometimes even rebuilt with extra modes,online leaderboards, wide-screen etc.. over a fixed collection of Megadrive ROM dumps that make up the Genesis Collection any day. How bout just make a Sega Ages Collection with over 80 games. I hate waiting for this one after another. @Sinton It looks like it is. The bosses are the same and Uriah the Dragon is there on the bonus stage. That would be great. I love the Master System. @Ralizah Well go ahead and pass, we don't need to know. @zitpig The sound track is awesome! I just hope SEGA provide a good mix of stuff that hasnt been ported a million times with the stuff we probably have multiple copies of. No disrespect to Space Harrier, great game, but yeah its a good game rereleased many times. Thunder Force IV was a good start choice. How about more rare gems like that? Heck, bring the other 3 over if you must. @DM666 I agree, I have had a real hankering recently to play some ps1 and dreamcast classics but I have a backlog of bloody amazing games on the switch and ps4 so I never get round to it. Although I did play a few hours of resi 1 one night which was fun and gave me serious nostalgia. Why not make all these Arcade games 10p ago to play - just like the they were originally intended. There could be a £7 option to own it. It’s worth remembering that any port of a Sega arcade game - irrelevant if how arcade perfect it is, is still missing 50% of the fun. Just think back to the cabinets of Space Harrier, Outrun, Super Hang On, Afterburner, Daytona etc, you can’t replicate that at home. I would love to see M2 do a port of Golden Axe: The Revenge of Death Adder. A Super Scaler game. Hopefully the first of many to come. And NintendoLife still talks like this is a compilation. As I understand it though, this is a digital rerelease label for classic Sega games. They're standalone downloads and Sega and M2 have already said it's not going to be limited to 15. 15 is just the initial group of releases due in the months ahead that are in production now or already wrapped up and ready to go when the time is right. And one hopes upcoming games have less embarrassing reveals than that YouTube video that Space Harrier received, more befitting of the source material. @OorWullie I'm with you mate! M2 will do a great job and even add content to old games. Nice, another one i want after Thunder Force IV and Gain Ground. @Sithee I too would do less than savoury things to myself for a version of Outrun on the Switch! However, I’m pretty certain SEGA no longer have the licence for the given manufacturer of a certain red sports car. I think this is why Outrun 2006 was pulled from the steam store. Really?! I don’t. I’m happy to pay for the much higher standard M2 releases offer. M2 are great and I own quite a few of their PS3 ports, but even their emulation isn't always perfect. 3DS Sonic does not beat the Android version. The PS4 Megadrive collection is also not bad at all, online multiplayer for selected games, nice CRT filters, rewind feature, 50 games (including multi region versions of some titles such as Streets of Rage 3), for £24. The emulation isn't perfect, but I've seen much worst. Space Harrier is not a game I'd buy as a stand alone again. @Sithee The 3DS version of Out Run is really impressive. @justin233 Yep, more modern Sega games are more needed at this point, but to be fair we got the Shenmue remasters and on Xbox One you have lots of Sega classics via backwards compatibility. However Switch is getting older classics only. About Aladdin and other brilliant Disney games made by Capcom and Sega, they are only available via emulation, a pity because some of them are 16-bit masterpieces. @BlueOcean Weren't the Disney games great? I shouldn't be driven to piracy to be able to play them again. @Microjak he'll yeah day one if the price is right. Also they have such a vast catalogue of great games, but insist on releasing the same ones over and over again. Give me Sega rally 1-3, burning rangers, virtual fighter, virtual on, jet set radio. My wallet is ready and waiting. Also I'd like fzero gx HD.. come on get this going fast rmx is good, but ot fzero GX good. Considering the fact that Disney is a huge media business and that Sega and Capcom are still strong, it's really weird we have never seen any of them on Wii's Virtual Console, the most expansive Virtual Console that has been created. @Scabhead Very true! I picked it up for the PS3. I'd love to see the sequel available for purchase. Emulation is about the only route unless you can track down a machine.